Use Mrs. Meyer’s Hand Soap? Stock up on Amazon. Hurry and get the Mrs. Meyers Liquid Hand Soap Refill, Basil Scent, 33 Oz. today for as low as $5.13 from Amazon when choose to subscribe and save to 5 or more items in the same month! Compare to $6.99 at Walmart or Target. Want it right now? It’ll cost $6.03. Plus, Amazon Prime members get FREE 2-day shipping! If you are not a Prime member, get FREE shipping when you purchase $25 or more of eligible items across any product category. 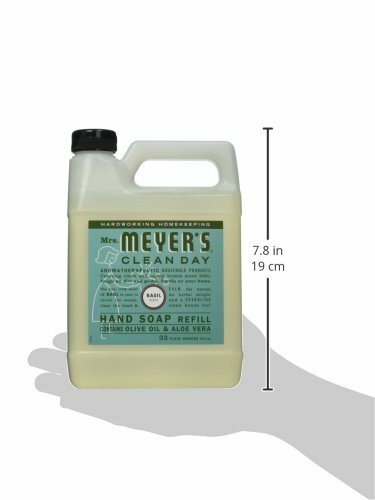 33 OZ, Mrs. Meyer’s Clean Day, Liquid Hand Soap Refill Jug, Basil Scent, Refill Your 12.5 OZ Hand Soap Bottle With Our Economical Refill, Now Packaged In A Jug. Buy the Mrs. Meyers Liquid Hand Soap Refill, Basil Scent, 33 Oz. from Amazon.